When you genuinely love something you will always find a way to do it. 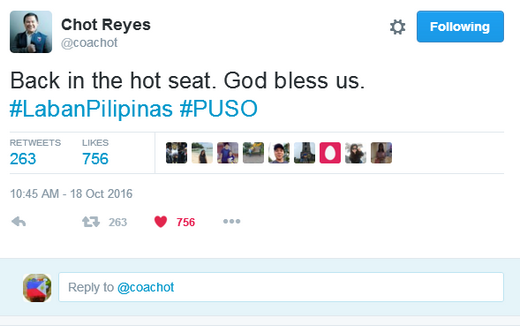 Take for example Sir Chot Reyes. Earlier this month he was named TV5's new president. And now, despite having a busy schedule he accepted the responsibility to be once again Gilas' head coach. The Samahang Basketball ng Pilipinas (SBP) announced coach Chot's appointment on Tuesday (October 18) along with Coach Tab being named as consultant. The proponent of the dribble-drive offense said that his main requirement is that all Gilas players must be a PBA player. "Kapag naglaro kayo sa PBA you're going to be in game shape, you're going to get a lot of training and more importantly it will teach you to adapt," Reyes highlighted.